Compare prices and find affordable car hire in San Francisco. We search among multiple suppliers to find the cheapest prices. Unlimited mileage, the necessary insurance and tax are included in the rate given. The city of San Francisco, California is one of the primary cultural and financial centers for the state. It is the fourth most populated city in California and the thirteenth most populated city in the United States. San Francisco boasts a population of 805,235 inhabitants (2010) and is 600.6 square kilometers in size. San Francisco is a hub for liberal activism in the country and is known for a number of famous landmarks, such as the Golden Gate Bridge and Chinatown. Fisherman’s Wharf is the most popular location in San Francisco for tourists. Things to see and do include Pier 39, which is full of restaurants, stores, cruises, and entertainment options, Aquarium of the Bay, Ripley’s Believe it or Not! Museum, the San Francisco Maritime National Historical Park, and it is also here where visitors can take a cruise to Alcatraz and tour the facility. Other things to include in a tour of San Francisco are the Cartoon Art Museum, the Contemporary Jewish Museum, the Wax Museum, Golden Gate Park, and the Japanese Tea Garden. Cultural events that take place annually in San Francisco include the Cherry Blossom Festival, the Fringe Festival, the San Francisco Blues Festival, Chinese New Year Festivities, and the Easter Parade and Spring Celebration. The San Francisco International Airport (SFO) services the entire region of San Francisco, California. 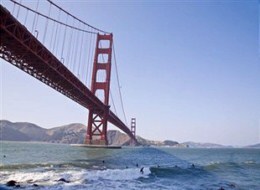 It is located 21 kilometers from San Francisco’s downtown district. It is the second busiest airport in California and the tenth busiest in the United States.